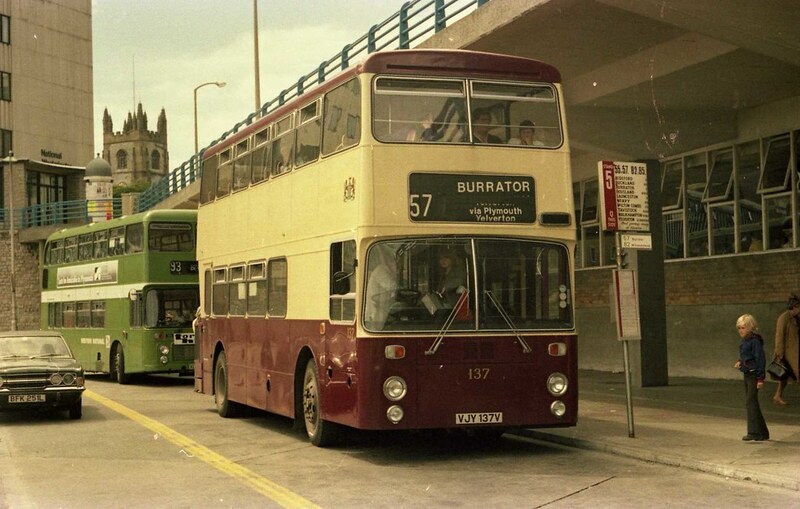 ©Preselected: Plymouth in 1980 and a new Leyland Atlantean and a modern Western National VR keep company in Plymouth Bretonside Bus Station along with a potential young enthusiast and a Ford Cortina Mark 3. Fascinating, given the competitive state of Plymouth's buses today (well, soon). Here we have a Joint Services working on the 57 that was once WN's but under PJS moved to the Corporation. The blind says "via Plymouth, Yelverton". It had to operate via Yelverton but via Plymouth indicates it originated somewhere outside the city (i.e. cross-city). Was that so? Or just the driver winding up the wrong information? The only bit of the blind with Yelverton on it was with the "via Plymouth" bit, so the driver didn't have much choice in what he could show.